Over the years, the Orange Bowl Committee has given millions of dollars back to the South Florida Community through its economic impact, support of events, organizations and causes, as well as its support of intercollegiate athletics and higher education. At last year’s event, approximately $100,000 was given back to the South Florida community. 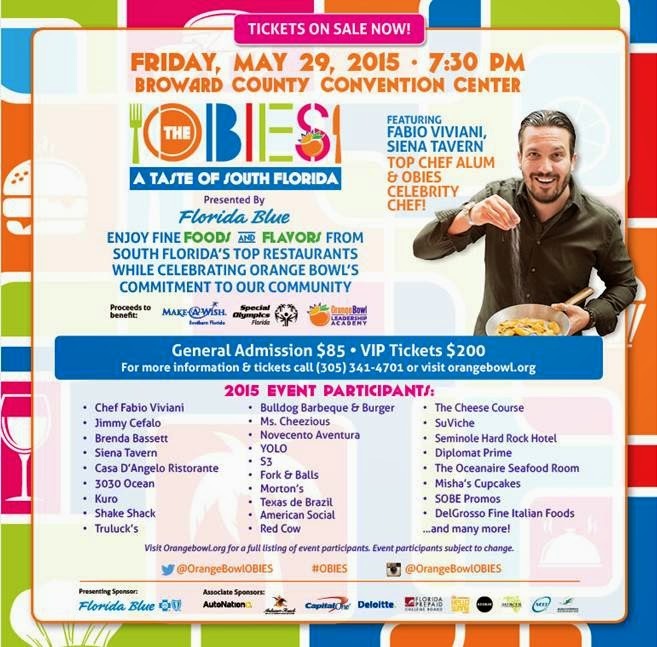 Top South Florida restaurants and chefs will have an opportunity to provide tastings and optional pairings. A panel of judges comprised of South Florida’s top foodies and culinary celebs will vote to determine a Miami-Dade County restaurant winner, a Broward County restaurant winner, a dessert winner and an overall “Flavor of South Florida” winner. In addition, each event attendee will also have a chance to cast their vote to award the People’s Choice Award winner!. Proceeds for the OBIES go toward the Make-A-Wish Southern Florida, Special Olympics Florida and the Orange Bowl the Leadership and Academy, which launched a pilot program in the Fall of 2014.